Welcome to the official site of the game dedicated to the worldwide community of G.P.S users., the first ever economic and geopolitical simulator game picturing the world as it stands today. You will find there various news, photos and videos, links and contacts. You will also be able to subscribe to the newsletter, which contains among other things the main files concerning the gameâ€™s functioning. 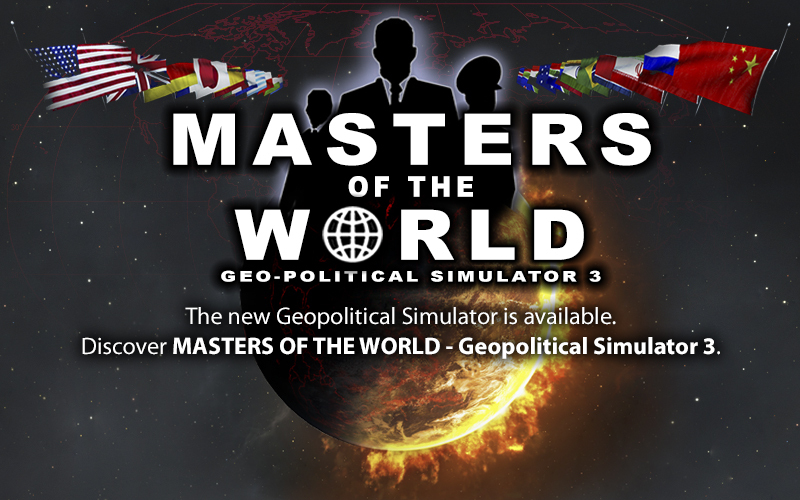 The new Geopolitical Simulator is available. "Thanks for putting out this type of game, I've been waiting for over a decade forÂ a game like this ever since I got burned out with Balance of Power. I've purchased other types of games in this genre (Super Power versions) (Supreme Ruler versions) but without a doubt you guys are running the show with this game." "GPS is just the true realistic simulation game I ever dreamed to play. You've done it. :-))"
"I'm really impressed by so detailled game content. All countries, all organizations, all political systems. I will recommand it to my students in my university." " ...this fantastic game, this simulation based on real data has allowed us toÂ see and understand the absurdness of reality."